Edinburgh maintained their winning start to the European Challenge Cup with a second victory over French opposition in as many weekends, defeating Agen. Back-row Cornell du Preez, who touched down twice last Friday against Grenoble, scored again for the Scots. 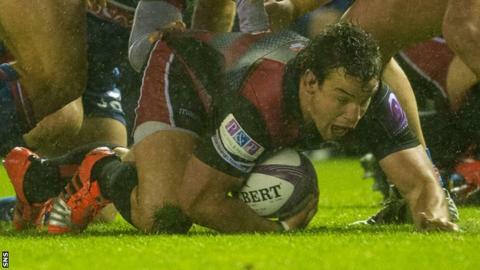 In typical fashion, Edinburgh's pack won a penalty try, and a driving maul allowed John Hardie to plunge over. Agen's points came via two penalties from the boot of captain Clement Darbo. Stand-off Greig Tonks, who is under pressure to exert a controlling influence at first receiver with his principal rivals - Kiwi duo Phil Burleigh and Jade Te Rure - injured, kicked well in testing conditions, slotting two early penalties for the visitors. And Edinburgh would stretch their lead before half-time from the sort of punishing forward pressure that has been a feature of their victories this season. A series of dominant scrums from Alan Solomons' pack prompted referee Peter Fitzgibbon to award a penalty try, duly converted by Tonks. Scotland flanker Hardie, who made his debut for the club in last weekend's win, was characteristically influential in open play, and though denied before the break, set-up du Preez for Edinburgh's second try on 44 minutes with a fine break and offload. Tonks converted again, before scrum-half Darbo struck a quick-fire double from the tee to put Agen - who lie bottom of the Top 14 - on the scoreboard. Hardie again splintered the French defence with another rambunctious break, his pass going astray 10 metres from the hosts' line. The New Zealand-born openside would get his reward, however, as he grounded from a maul to score his first try for the club, Tonks once more adding the extras. A scrappy final 10 minutes culminated in second-row Fraser McKenzie being sin-binned for an infringement at the breakdown with the clock red, with neither side able to alter the scoreboard. Head coach Solomons can be pleased with the efforts of his formidable assortment of forwards, and the depth he has assembled in his pack, but is likely to be frustrated with Edinburgh's failure to clinch a fourth try and a bonus-point for the second successive match. Agen: Francois Tardieu, Leka Tagotago, Pierre Fouyssac, Julien Heriteau, Filipo Nakosi, Francois Bouvier, Clement Darbo (capt); Quentin Bethune, Marc Barthomeuf, Nicolas Chocou, Jean-Baptiste Roidot, Leo Bastien, Sione Tau, Antoine, Miquel, Marc Baget. Replacements: Florian Dufour, Viliamu Afatia, Dave Ryan, Corentin Braendlin, Felicien Vergnon, Baptiste Cadiou, Timothe Guillimin, Benoit Sicart. Edinburgh: Dougie Fife, Tom Brown, Will Helu, Matt Scott, Otulea Katoa, Greig Tonks, Sean Kennedy; Alasdair Dickinson, Ross Ford (capt), WP Nel, Anton Bresler, Fraser McKenzie, Nasi Manu, John Hardie, Cornell Du Preez. Replacements: Neil Cochrane, Rory Sutherland, Simon Berghan, Alex Toolis, Jamie Ritchie, Nathan Fowles, Blair Kinghorn, Chris Dean.